Silvassa, January 19: “My world revolves around the 130 crore Indians. My aim is to make India the best country in the world in the 21st century. We work for 130 crore Indians and not for one family”, claimed PM Modi while addressing the sea of people at Silvassa. After the inauguration of the Armoured Systems Complex (ASC) at Surat’s Hazira, Modi visited Silvassa the capital of Dadra & Nagar Haveli, laying foundation stone of Medical College in Sayli. 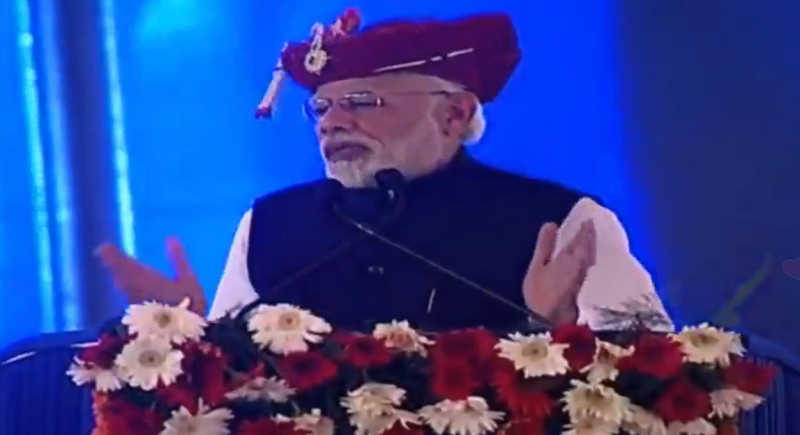 He also launched various development projects in Daman & Diu leading to the upliftment. He also launched the m-Arogya app and door to door waste collection, segregation and processing of Solid Waste in the territory digitally following the release of IT policy. Pradhan Mantri Jan Arogya Yojana certificates and Forest Rights certificates were given to few of the beneficiaries meanwhile. “The Setting up of Medical College in Sayli in Silvassa will improve tertiary care facilities in both Dadra & Nagar Haveli and Daman & Diu, and adjoining areas. It will benefit the students, especially those of tribal and rural areas of the two UTs. It will increase the availability of doctors and enhance medical education opportunities to students. Rs 210 crore has been earmarked for the construction of the medical college and hostels for medical and para-medical college and residential buildings”, said PM Modi in his address. Our only aim is development. We want to work for 130 crore Indians. Today almost all of the needy citizens have been provided with free LPG gas facility, clean drinking water, clean toilets, effective health facilities and roofs. It is in the last four years that the number rural homes built in the nation have increased from 25 crores to 1.25 crores. With the aid of Ayushman Bharat scheme, we have launched various healthcare centres throughout the country, asserted the Prime Minister in his address. Along with Silvassa, Daman and Diu has been at the centre of various development projects. 13000 ladies in the union territory have been granted free cooking gas and that the employment opportunities have also been extended. Government is working for the betterment of the fisher folk of Daman Diu with the help of the Blue Revolution, he added further. None of the national schemes implemented or introduced to serve the people constitute ‘Modi’ as a name. All the schemes start with ‘Pradhan Mantri’ and end with ‘Jan Kalyan’ in its purpose. Our focus is on 'kaam' rather than 'naam’, asserted PM Modi targeting the Gandhi family. “We work for 130 crore Indians, not for one family. These people fear of my strict actions against corruption and that I am trying to make the system transparent. I work for the betterment of poor and strive to provide education to every child, employment to youth, affordable medical facility to the age olds and justice to the masses. Fearing this, the oppositions are forced to make alliances.”, he said. “BJP has woke up all the corrupt forces in West Bengal. Today they are afraid. Once we have started our anti-corruption drive, Congress has smelled fear and started Mahagathbandhan, he asserted.